See the previous holders in the roll of honour here. The final results of the 2013 League and the dates for the 2014 League are on the League page. Some great junior results, report on the junior pages. From Paul Stephens ... A beautiful morning for another canter round the Bronte moors (or a gallop if you're Tom). We all know how grim it can be at Penistone Hill, but not on Sunday. It was great to be out, albeit with 400 others and plenty of Harriers. To be fair the course coped, and it didn't feel like that many. The mud was sticky, the climbs were hard, and the 3 river crossings, well..... My time wasn't great, but I've usually been about half way down the field and this year was no exception. I had thought this used to be a relatively small race - 100+, but I was wrong, it's always been popular. It was twenty years ago that I first did the Stanbury Splash and there were 299 people finished that day. And thanks to Nick for the lift. The IH Race League has been updated and Jane McCarthy has a great lead not just from this race but from playing her wild card to great effect. Many super runs from the juniors too U8-U18! Interestingly, both the Brass Monkey and the Stanbury Splash are in their 31st year! Justin Phillips reports ... I managed to secure a last minute entry to run the Brass Monkey and joined a car load of Harriers for the trip to York. Chilly weather had us all shivering on the start line but by mile 1 the rain was replaced by sunshine and made way for a beautiful day. Steve Weston shot off from the �whistle' (the hooter had succumbed to the rain) and by the time I finished he'd already had a massage and a tuna sandwich. The course is one of the fastest around and after swapping post-race stories it seems the Harriers contingent were pretty pleased with their morning's work. From Dave Wilby ... Superb run from Georgia Malir today, she gave fell and XC expert Katie Walshaw, and World Marathon Champs 10th place finisher Susan Partridge a real run for their money to finish 4th overall and 2nd junior. The first 4 put over a minute into the rest of the field, including Annabel Mason which just shows the quality they produced. There were 25 Junior Ilkley Harriers racing, with some super team results, including the girls in the photo who won U15 Bronze. 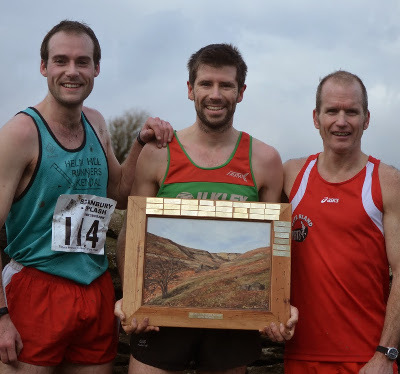 Will Buckton reports ... Epic conditions for the New Years Day run up and down Nine Standards Rigg from Kirkby Stephen. BM 12.9km/549m Snow, hail and high wind made it a real battle on the climb.